I will admit to a lot of disappointment in this book. I really wish I had read a few reviews before requesting the first two books and this sequel. Then I would have probably not cost my sponsors at MX Publishing the cost of the trilogy. There were many detectives, with similarities and differences to Sherlock Holmes being published in the Strand and other magazine simultaneously. Dr Thorndyke, created by R. Austin Freeman, was a doctor who solved crimes thanks to his extensive medical knowledge. Ernest Bramah came up with Max Carrados, the first ever blind detective, who enjoyed popularity in the Strand. Lady Molly of Scotland Yard was another detective from the mind of Baroness Orczy, and one of the premier female detectives. The thing is that they can stand on their own merit. And so can the tales of Martin Hewitt written by Arthur Morrison. 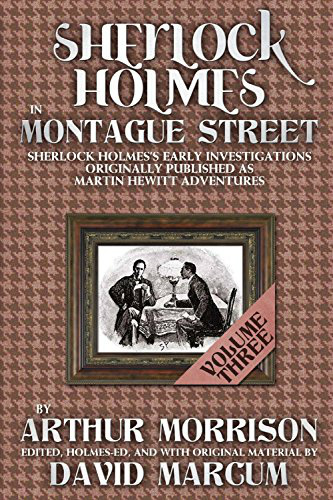 Hewitt was much more of a “people person” than Holmes. Then too, Hewitt worked out of an office in the Strand, not a private residence.